I’d apologize for the week+ of silence from my 365 day challenge. Except that my time away has been a revelation. And there will be more radio silence in the weeks to come as I travel and shoot and learn with amazing fellow photographers and guides and instructors. The ones who participate in and lead the groups I’ll travel with, and the fellow travelers I’ll stumble across along the way who will unknowingly inspire me. 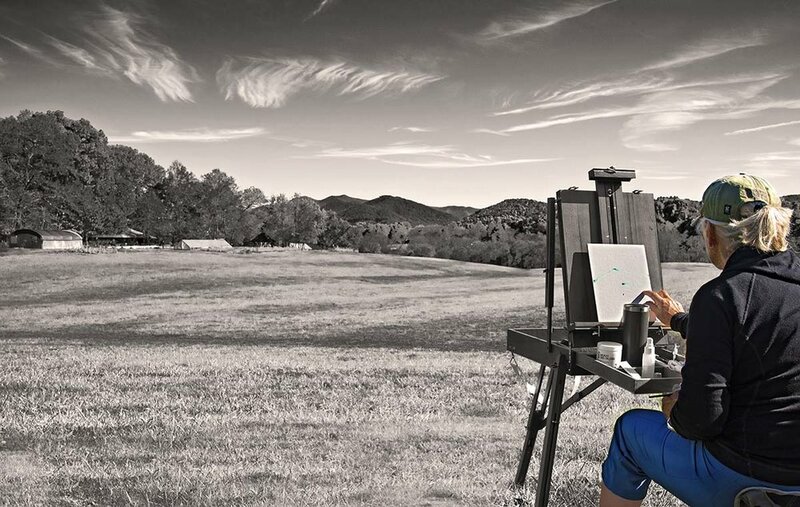 This lovely painter happened my way while at the folk school, setting up to capture with her acrylics one of my favorite Brasstown views. The above image is a selective-color infrared capture of her finger painting in the very first typography of her image. The processing choice (achieved in Photoshop CC) seemed appropriate, given the extreme creativity on display by both subject and setting. The below, of her painting about halfway through her process. I hoped to have done her justice. Watching her work and being invited to shoot her process was a gift I hope to honor as I send her back these images as my thank you. More images from my travels to share in tomorrow’s post. But for now, my wish is for you to travel yourself. To explore. To paint, whatever catches your artist’s eye.